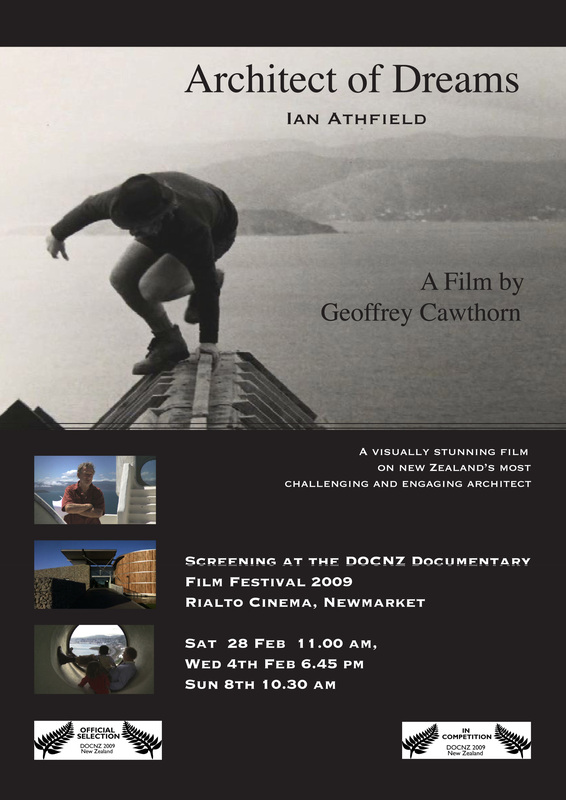 A documentary on the life and work of Architect Ian Athfield, written and directed by Geoffrey Cawthorn. Geoff also composed the score for this award winning film. Architect of Dreams is a beautifully crafted, stunningly photographed celebration of the life Architect Ian Athfield, one of new Zealand’s most celebrated and original architects. Intelligent outspoken, amusing and engaging Athfield is considered by many one of New Zealand’s most influential creative figures who brings a unique vision to his practice of over 40 years. Athfield has a highly personal process – working closely with clients in an interactive way, creating sites that speak to the landscape and to cultural and social needs. At the heart of Athfield’s practice is his own monumental Athfield House on the Kandallah hillside. Part family home, part office, a village almost. It is a truly personal vision and Athfield has built much of it himself, brick by brick! The film explores his life and work from the 60’s when he shook up the establishment with bold, radical buildings through to the present where his ideas of sustainability and an architecture that builds community are now being embraced. Athfield eschews iconic buildings in favour of an organic approach which respects the sun, the site and existing structures. ARCHITECT OF DREAMS is mosaic style portrait of a unique individual whose life, work and art are singular and all consuming. It’s a film about ideas, about living out ideas, about success and failure, about developing a vision and a way of working. ARCHITECT OF DREAMS profiles the energy, spirit and intelligence of one of New Zealand’s most creative forces. The film takes the viewer on a gliding tour of his own labyrinthine house as well as the many and varied buildings Athfield has designed including the Wellington Public Library and Civic Square, the Adam Gallery and Sam Neil and Allan Duff’s houses.